This post brought to you by Chase Mortgage Banking . The content and opinions expressed below are that of Everything Finance. It’s time to stop renting. When you rent a home, your hard earned money is going to someone else to pay their mortgage. Buying your first home is the most important investment you could make. In most scenarios, people who buy a home actually save money on their living expenses and the money goes to building a future investment. Buying a home can at first seem hectic. But before you work on furniture removals, it’s important to understand that there is mortgage information and resources available to help. It is very necessary to have an idea of the different costs and the ways that will make buying a home for the first time a smooth process. A good place for a first time homebuyer to start looking for is the financing option that suites their needs. There are a lot of options that a homebuyer should know before applying for a loan. Many people plan to buy a home with other family members, friends or a partner. Buying a home with someone else can help save a lot of money and also broadens your home and financing options since your capital is shared. This isn’t always the case; some partners decide to take on all of the capital themselves if their credit or financial situation allows them to receive better options. Buying a home for the first time is a big investment to your future. The cost of a home can at first be deceiving and make it difficult to pursue purchasing the home. Although there are some initial expenses involved with homebuying, it’s best to have a good understanding of what to expect. It is always better to compare all the mortgage options and choose the most feasible one for yourself. The year 2014 closed with mixed results in the real estate sector despite continued improvements in other facets of the economy. This year, there is an increased sense of optimism, especially as the competitive spring buying season approaches. For the first time homebuyers it is always suggested that you have a proper understanding and plan of what costs you may encounter. Consulting with a mortgage lender is an important step in hassle free homebuying. 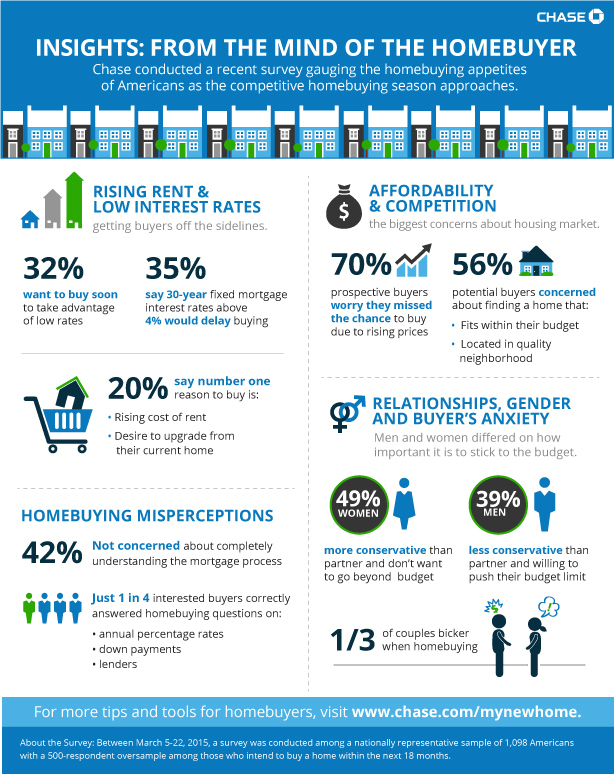 Chase Mortgage Banking recently commissioned a national survey on consumer attitudes regarding homebuying. As you can see from the infographic above Chase got some interesting results regarding the first time homebuyer. 3 in 10 Americans say they plan to purchase a home in the next 18 months. 43% feel that getting a mortgage loan will be easier this year compared to last year. Economic drivers prompting potential homebuyers to get off the sidelines are interesting. While historically low interest rates have been enticing buyers in recent years, survey results show the rising cost of rental properties is playing a major role. In fact, 20 percent of survey respondents said the rising cost of rent — making owning a better value — is their number one reason to buy. For those who are already homeowners, 20 percent said their desire to make an upgrade from their current home is their number one reason to buy. 32 percent of homebuyers want to buy soon to take advantage of low rates. 35 percent say that 30-year fixed mortgage interest rates rising above 4 percent would delay their decision to buy. Potential homebuyers are optimistic that it’s a good time to buy but they anticipate challenges. Nearly 70 percent of prospective homebuyers worry that they may have already missed the chance to buy at the best time because of rising home prices. The homebuying process can feel overwhelming but there are helpful resources available to walk you through every step of the process. Like the My New Home YouTube channel, which offers tips from real homebuyers along with expert advice on everything from getting started, to finding and financing a home and more. Each video features advice and insights from real homebuyers and industry experts. Chase Mortgage Banking also provides a variety of tools that are available to all homebuyers including information about buying a home and a mortgage rate calculator. Visit Chase Mortgage Banking for more information.